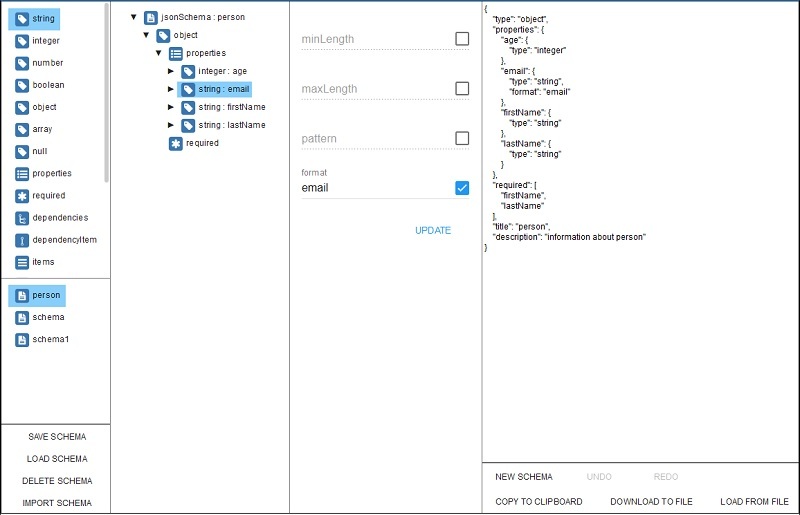 JSON Schema Editor is an open source project, which is an intuitive editor for JSON schema. It provides a tree view to present the structure of schema, and a property inspector to edit the properties of schema element. List of all elements of JSON schema, could drag and drop to tree. List of all user schemas, user could save, load, delete and import schemas, schema could drag and drop to tree. The structure of schema, could expend or collapse at any level. Right-click on the element in tree view could bring out the context menu for that element, and perform actions specific for that element. A panel to edit properties of schema element. A text view to display content of schema. The element of JSON schema could drag and drop from pallet to tree view or within tree view. Undo and Redo could keep track of every update of schema. User could save/load schemas to/from on-line repository, import schema from file. Copy content of schema to system clipboard. Download content of schema as a JSON file. Load content of schema from a JSON schema file. If you have any issue about JSON Schema Editor, you may send it to the project's repository. JSON Editor is successor of JSON Schema Editor, which is a schema-aware editor for JSON document including JSON schema. It provides a tree view to present the structure of JSON document, user could manipulate the JSON from context menu. There is a text view to present the content of JSON document, user may edit JSON within. They share user accounts and user schema repository, so user could use one account to login both editors and access schemas.